6. Fill in the FURTHER INSTRUCTIONS BOX We need some information from you to go with this order to make the process faster. order number for the first order you made with us - the order with the digitizing fee for our reference. to help ensure consistency, please add in the colors for the patch clearly so we know what we are doing for your patches - i.e. Black Merrow, multicam background, skull in grey with red eyes. This makes things so much easier - we have done thousands of patches and don't always remember every single detail. We do keep all of the patch files on record, but they do not keep any of the thread color details in them, so we need your help here. 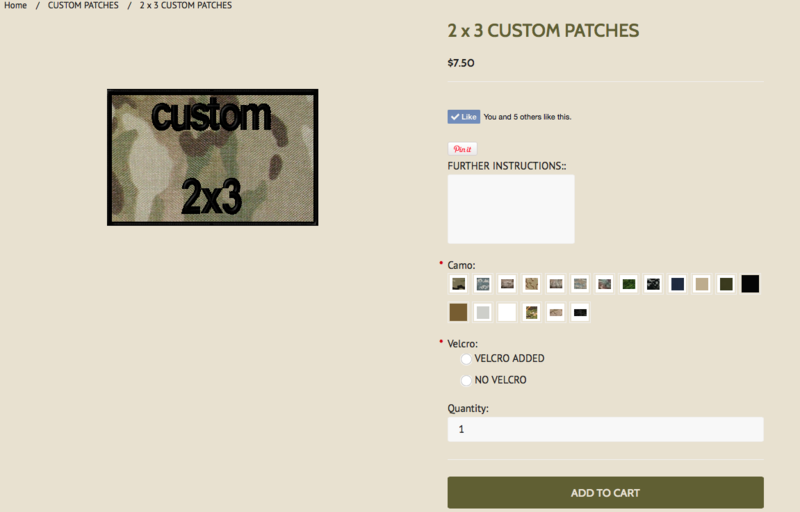 if you order a total of 10 patches, and 8 are in multicam and one is in OD, then here is when you let us know that - you can only order one color at a time, so it may be easier to just let us know what you need. Again, lay out the colors for the new camo background. any other information that you think we should know. Let us know exactly what you expect and want and we can make it happen. Be precise...be clear and let us know everything. Some customers send us an email with pics of the patch that we previously did for them. Awesome idea! We can use this to make sure everything is exactly perfectly how you want it. PLEASE GIVE US FULL INSTRUCTIONS WHEN REORDERING YOUR PATCHES. It will help expedite your patch order, and ensure that the order is exactly what you want.